It has been a November to never forget for one Detroit intern. And it’s not because the boss gave him the full-time job he coveted. While most metro Detroit families this Thanksgiving are stuffed with gratitude and football, one family is covered in both. Few could’ve bounced as high in the workplace the last few weeks as Corinthian “Cori” Gray. The 22-year-old is a communications intern at the Detroit Zoo. And he continues to gleam thanks to a phenomenal effort from his older brother that assuredly put a greater shine on Thanksgiving this year. Cori’s brother, Jonas Gray, is an NFL running back for the New England Patriots. A few weeks ago, Jonas flew Cori and his mother Jerri to Lucas Oil Field Stadium in Indianapolis for the Patriots-Colts game. Jonas wasted little time welcoming his family to game day; he scored his first NFL touchdown in the first quarter. His 4-yard run gave New England an early lead. Still beaming, Jerri and Cori barely had time to catch their breath before Jonas scored a second touchdown – this one from 2 yards out – before halftime. Jonas scored twice again in the second half. Jonas broke off not 1, but 4 rushing touchdowns, in a single game. Literally, he became a headline overnight. NFL writer Peter King of The Monday Morning Quarterback gushed over his performance. Two days later, Jonas was on the cover of Sports Illustrated. The next day, the NFL named him AFC Player Of The Week. Jonas Gray’s day to shine in the NFL led to a 42-30 New England win, earning the Pats first-place at 8-2 in the AFC East. New England hosted Detroit in Week 12, killing the Lions, 34-9. 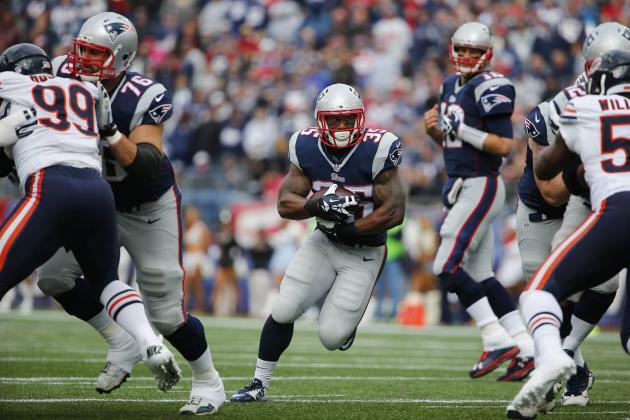 Undrafted from Notre Dame in 2013, Jonas Gray signed with and was later released by Miami. He was picked up by Baltimore, landing on the practice squad there before joining New England. Injuries to the Pats’ running back corps at that time cleared a spot for serious playing time for him in Week 11. Gray finished his breakout game against the Colts with an eye-popping 201 yards on 37 carries. He was targeted once for an incomplete pass. That’s some big talk, as it should be, for a galvanized family of three that coalesced on city streets oftentimes more grim than not. In neighborhoods with not a lot of opportunities for youth, attaining goals gets tricky quickly. “Nobody expected much from us,” Cori said. What a terrific undoing of perception. Expectations shift swiftly. Perception can be reality. And a cop mom raising two boys by herself in a tough town is going to go in one of two directions. Parts of Pontiac are no joke. And yes, mountain bike patrol in the downtown nightlife/drunky-obnoxious detail. Jerri Gray has walked the beat while marching to her own. Both Jerri and Cori agree that the cornerstone of their upbringing was a never-quit attitude instilled and upheld by Mom. Cori says that Jerri’s confidence and encouragement evolved into a roadmap for their success. But that same love came also with a steep price to pay for stepping out of line. “My mom is 5 feet 7 inches. And she don’t play,” Cori said, laughing. Jonas texted Cori a mockup of the Sports Illustrated cover coming out the next day. Player of The Week honors followed; and that, after a 4-touchdown dream game by their brother and son, the Grays on this Thanksgiving weekend might still be over the moon. Cori continues his internship at the Detroit Zoo, cutting his public relations chops by writing press releases, coordinating events and working as a liaison between media and the Zoo. He also works full time at D1 Sports Training, a factory of high-end conditioning and training for the serious athlete, co-owned by Detroit Lions defensive end Ndamukong Suh and former tight end Tony Scheffler. Moms like Jerri are proud of their boys, be it the gridiron or the sandbox. Jerri’s Sunday was almost other-worldly. Her son, in his first NFL game where he really saw meaningful playing time, scored an unimaginable 4 touchdowns. The NFL record for single-game touchdowns by a running back is 5, a title held by five players. More than 50 running backs have scored 4 times in one game. Gray joins the annals with such running back legends as Earl Campbell, Jim Brown and Barry Sanders. The Grays hope more Sundays are like Week 11. In the interim, Jerri assures that Sundays in her home continue to see her sacred, end-of-the-weekend routine thrive – breakfast, church, and then back home to start cooking and dialing up the slate of NFL games on TV. That’s not much different than the plans of most football fans on a Sunday. But at Jerri’s house, she could be watching her own son on game day. Update: Jonas Gray is in the process of making amends for arriving late to practice Nov. 21, a mistake leading to plenty of Internet headlines and a dismissal from the team’s facility for a day, courtesy of coach Bill Belichick. Jonas did play in the Week 12 game against the Lions. Jonas Gray wasn’t the only running back in New England to make news that week. The Patriots signed recently released running back LeGarrette Blount Nov. 20. Blount’s presence and the improved health of running back Shane Vereen – ahead of Gray on the club’s depth chart — could minimize Jonas’s opportunities as the Patriots march toward the playoffs. In the Week 12 matchup against Detroit, Gray registered no carries for 0 yards in a 34-9 Pats win. Jay Fosgitt knew at a young age that when he put pen to paper, he could create something special with his illustration skills. As he grew older, and better, he creating something especially significant with his ability; he crafted a career. A city’s struggles do not paint the picture of its identity. And yet, in towns like Saginaw it oftentimes seems like the discussion of the city’s blemishes are heard louder than the tales of its beauty. Saginaw, however, is trying on a new look, as major projects rooted in revitalizing historic properties are spearheading a makeover expected to yield grand results. At the core of these efforts are the renovations and resurrections of a couple of historic, iconic buildings in Saginaw. One, in Old Town, is driven by former Saginaw resident and current West Coast transplant, David Strouse. The CBS executive is transforming three Old Town properties into renovated, usable structures. And he’s hardly stopping there. The other is in downtown, where entrepreneurs James Bricault and Alicia Zarazua are resuscitating an architectural icon in Saginaw, the Bearinger Fireproof Building. Both parties are taking historically rich, but crumbling and mothballed buildings, and restoring them not only back to their physical glory, but making them key assets to the city again. Projects like these got a major shot in the arm in 2012, when Old Town received Main Street designation, which helps guide redevelopment in historic downtowns. 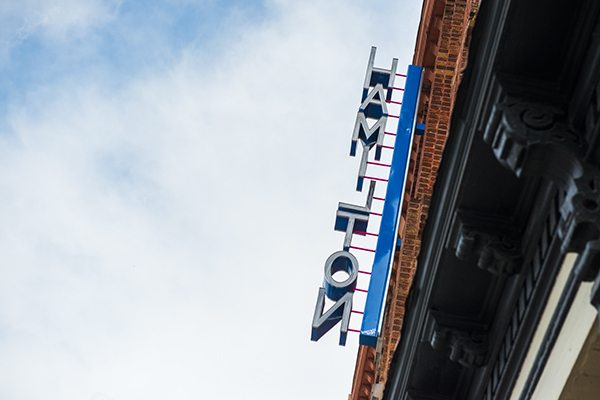 In Old Town, Strouse has purchased three buildings: 312 S. Hamilton (a former candy shop built in 1881), 318 S. Hamilton (a two-story retail structure that was a carriage shop) and a larger endeavor, 118 S. Hamilton, home to the Hamilton Apartments, a project that has become the signature to Strouse’s preservation efforts. Work began, using as many local vendors as possible. Through the U.S. Department of Interior, he was able to earn historic rehabilitation tax credit assistance for the renovation. The building was also placed on the National Register of Historic Places. Monies from the Saginaw Economic Development Corporation for the first $100,000 kickstarted efforts, and additional financing from Chemical Bank helped defray the costs of massive HVAC work and structural repair. Now, since an October 2012 ribbon-cutting, the building thrives with nine apartments that are consistently rented, ushering in a new, refreshing type of resident in this part of town. And more importantly and critical to urban renewal, there are vibrant residents living in a building in a part of town that didn’t have a lot of residents. That’s nine more apartments–and sharp ones at that; with Martha Stewart-inspired accents and strong, rich design tones–housing people who support Old Town’s business community, which could’ve easily slipped into irrelevance. So, what exactly, is the impetus behind spending hundreds of thousands of dollars on a massive renovation that will take a decade or more to yield profits? Why throw everything you have–money, soul, effort–into an old building that’s about to collapse? In the city’s central business district, Bricault and Zarazua bought the Bearinger Fireproof Building on Craigslist.org, with designs to revamp the 60,000-square-foot, 141-year-old architectural stunner into a hub of glowing community activity. The glorious red brick, Chicago School-inspired, six-story building–replete with atrium, marble work, and brass fixtures and oak trim–has been on the National Register of Historic Places since 1982. And speaking of the ’80s, that’s right around the time the building began its descent where it would ultimately flatline. According to Tom Trombley, deputy director of the Castle Museum with the Historical Society of Saginaw County, the Bearinger Building, for decades, was a thriving epicenter of business and commerce in downtown Saginaw. A popular department store occupied the main level, while the upper five floors were used for office space. This was in the ’30s and continued well into the ’70s, when occupancy was still full. Trombley said the building began to change hands into the ’80s and ’90s, and although it still had tenants, that period is when the Bearinger began to see its decline. From the ’90s on, the Bearinger had been home to a thriving creative community, with artists and musicians working out of a handful of upper-floor studios. The last tenants, including a main floor coffee house, were shown the door in 2008. It remained inactive until Bricault and Zarazua purchased it later that year. The two have a magnificent vision for the building, with a slew of businesses scheduled to open along the main floor in 2013. New tenants include everything from a deli and jewelry store, to boutiques. Future developments include a wine and martini bar, sixth-floor restaurant with sweeping city views, a tattoo shop, fitness center and daycare facility, among many others. Like Strouse, Bricault and Zarazua worked in concert with SEDC, who provided crucial loans to get the renovations started. Bricault and Zarazua also worked with the Michigan Small Business and Technology Development Center, which shepherded the two through business planning and strategies. The renovations have been extensive and with a 2013 grand opening as the goal, Bricault said recently that developments have slowed. Developments in these areas aren’t the only ones moving forward. Strouse is currently working on a five-building rehab of some historical structures at Genesee and Washington in Saginaw’s downtown. There, he is meeting with Saginaw’s Downtown Development Authority as well as the Department for Housing and Urban Development, to save five buildings, including the Bancroft Building, the Eddy Building and the Mason Building, among others. Paul Barrera, owner of Jake’s Old City Grill, also has plans, according to Strouse, to renovate the upper floors of the historic building that houses his restaurant on Hamilton Street. Also in development is a 20-unit condo installation in a historical building stretch along Court Street, between Niagara and Hamilton in Old Town. As pieces of the puzzle that can be the revitalization of a neighborhood come together, it’s clear Saginaw is home to a lot of bright minds, willing hands and motivated, community-minded business people who are stepping up to do the work that has to be done to move the city forward. It’s appropriate that they’re using Saginaw’s roots and bones to do so. John Horn has been a journalist for nearly 20 years, including 12 as a freelance writer. He has covered city government, crime, real estate and sports for both community newspapers and large, metro dailies. He has written extensively about dining and drinking in and around Detroit for numerous clients, locally, nationally and internationally. He loves the city. He loves up north. He loves his wife Kerry, their toddler daughter Maeve, their 80-pound Labradoodle, Lamont, and the Detroit Tigers. In that order. The on-loan property on which they’ve been urban farming has been sold to a developer who will, literally, put down a parking lot. So, now what? I spoke recently with Padraic Ingle, director of Grow Saginaw about his next move. Read more here. You can’t help but notice them, as they (not so) slowly sprout up around the state; these enormous, stark white windmills. Not traditional windmills evocative of a Dutch postcard, rather, these are sleek, aerodynamic wind turbines, and they are progressively turning Michigan’s agricultural land into wheelhouses for clean, renewable energy. Wind farms have been built in the Thumb, mid-Michigan and the western side of the state–and the Upper Peninsula will soon be home to its first wind facility. Heritage Sustainable Energy of Traverse City is erecting upward of 13 turbines in Delta County on the Garden Peninsula. Garden Wind Farm should be completed before year’s end. Each turbine is expected to generate 5,000 megawatt hours of energy per year. One turbine was completed at the end of 2011. According to Delta Township Supervisor Morgan Tatrow, the project is still on pace for 2012 completion. “It’s very much on track,” he says. He said 13 concrete bases have been installed. From early to mid-June, 125 to 130 semi trucks are expected to roll into Delta Township with the remaining turbines and their components. With newfound usage for previously unused or under-used agricultural property, the creation of new jobs, new tax base revenue and a continued renewable energy source, Tatrow said the ripple effect on the Upper Peninsula community is welcomed. In mid-Michigan’s Gratiot County, near Breckenridge, 133 wind turbines went live at the end of 2011. Built by General Electric, these turbines are 460 feet high and are expected to generate more than 200 megawatts of electricity for 50,000-plus homes for nearly 20 years. An average two-story home uses about 50 kilowatts per day, or 1,500 kilowatts per month. Of the 133 turbines, 58 are owned by DTE Energy; the rest are owned by Chicago-based Invenergy, which, seven years ago, first explored the area, asking residents if they would be willing to lease land. So, why Gratiot County? A privately held company studies wind activity in a specific region. If viable, it approaches local land owners about leasing their land to house the turbines. They work with residents and local governments to move forward. Once approved by land owners and local officials, a land bank is created, crews are brought in and turbines are erected. The wind turns the turbines’ blades, creating electrical energy stored on a grid. Part of that energy is sold to power companies like DTE. The rest is housed and distributed. 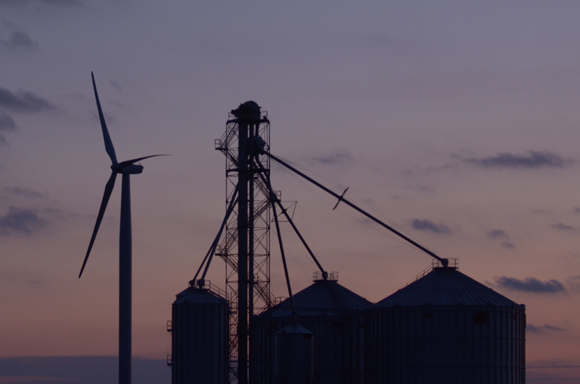 Successful wind farms need a place to collect the energy and tie into a power grid. Gratiot County has that, thanks to the presence of a closed refinery in the community and a former Tier-1 automotive factory. “The lines are still around,” says Schurr. Things appear to be working out well. Schurr says Des Moines-based wind farm developer Excelon has already started Phase I this summer of a second wind farm in Gratiot County. 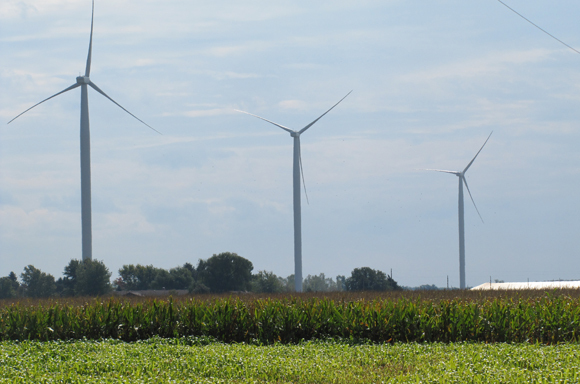 Beebe Community Wind Farm LLC is expected to be operational by the end of 2012, with 38 new turbines generating energy just south of Gratiot Wind. Construction in the county created 150 jobs for the first farm in Gratiot County. About 15 employees will work full-time in engineering and maintenance on the property. Schurr said 250 families were involved in leasing 35,000 acres, with property owners getting $70-$80 per acre. And while it appears to be a win-win-win with the wind, not everybody is overjoyed. In the U.P.’s Garden Peninsula, residents have made their opposition clear. Some don’t want to have to look at the towers. Others are concerned about the safety of migratory birds like bald and golden eagles (and some bats), who could face a shocking end while negotiating these huge, very strong fan blades in their flight corridors. Opponents have peppered local officials and wind farm developers with questions and concerns. Michigan’s Fish and Wildlife Service has been aggressive in working with companies like Heritage to establish best practices. FWS Field Supervisor Scott Hicks says the Garden Peninsula development is a proving ground to see how disruptive–if at all–construction projects like this will be to aviary preservation.